Louisiana State University Press, 9780807153031, 73pp. Passionately written and perfectly crafted, Anya Krugovoy Silver's poems help us to view life through a different lens. 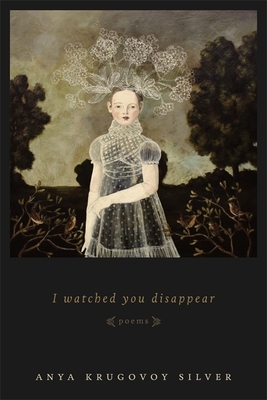 In I Watched You Disappear, she offers meditations on sickness but also celebrations of art, motherhood, and family, as well as a sequence of poems based on the fairy tales of the Brothers Grimm. Throughout her collection, Silver examines feelings of pain, anger, and urgency caused by a serious illness and presents the struggle to cope in a lyrical and moving way. Never overwhelmed by her own mortality, Silver manages to speak with beauty and grace about a terrifying subject. In her poems based on Grimm's fairy tales, Silver subtly and surprisingly interweaves retellings of these tales with reflections on life and death. Infinitely touching, engaging, and finely tuned, Silver's poems invite us to look at the lives we love in new and profound ways. Anya Krugovoy Silver's previous collection from LSU Press is The Ninety-Third Name of God. She has also published poems in many journals, including Image, Five Points, the Georgia Review, Prairie Schooner, Crazyhorse, and Christian Century. Silver is an associate professor of English at Mercer University and lives in Georgia with her husband and son.